Please note: This item does not come in a retail package. 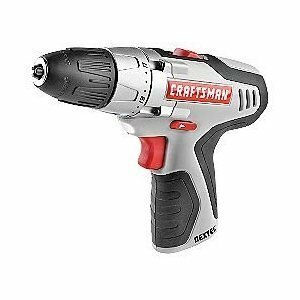 Improve and Enhance Your Work Performance and Productivity With the 12.0v Drill/Driver from Craftsman The Craftsman 17586 NEXTEC Drill/Driver offers 195 in.-lbs. of torque with a dual speed of 0-1300 Hi and 0-400 Lo. With its powerful torque and dual speed feature, you can use this drill/driver for different applications ranging from driving screws into wood, plastic and metal to drilling. A 2-speed gearbox means that you can adjust the speed for drilling and driving operations. This 12.0V Drill/Driver is equipped with an 18 position adjustable torque clutch so you can fine tune the settings for driving small screws as well as larger, heavier screws. It gives you more control while working and the motor lasts longer with a correctly adjusted clutch. Powerful and user-friendly, this is an essential tool for your home or workshop. If you have any questions about this product by Craftsman Nextec, contact us by completing and submitting the form below. If you are looking for a specif part number, please include it with your message.